24 HOURS is a 24-hour, interdisciplinary non-stop workshop-happening for people of all kinds. During the preparations for this year's CYNETART 2017, the choreographer and dancer Valentina Cabro woven artists from Ukraine, China, Belgium, France, Slovenia, Germany and England into a total work of participatory art. This kind of art and its structure comes alive through the interaction of workshop participants and artists. People without previous knowledge, as well as participants coming from the dance, performance and sound art are very welcome. Celebrate with us in the large hall of the Festpielhaus Hellerau for 24 hours the life as a laboratory, a big stage and a community space for learning. 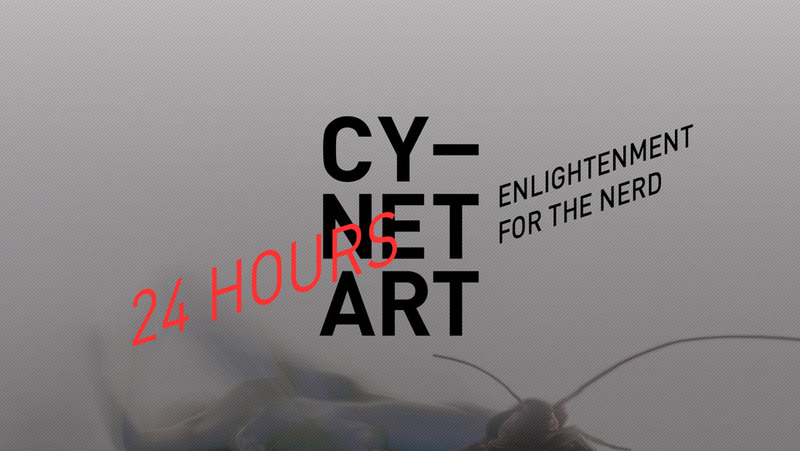 CYNETART brings you into contact with one another in a 24hr contact, refamiliarizing us with our most complex communicational device that we own: our bodies, which will be led through a journey of performances and information incorporated into a 24hr construction. There will be guided contact improvisations throughout based on the subject matter. As “The 24 hr Web” unfolds through time and rearranges space we invite you to improvise and make contact with the complex sensory network of our own analogue body. This sonic playground gives space and time to move in meditation in or out of contact with living and non-living matter and experience the affects of sound and light directly and indirectly through the reflection of sound and light in an ever changing space. Caroline Beach, Valentina Cabro, Sascha Henkel, Luo Yuebing, Marcello Lussana, Jonas Marx, Lotte Mueller, Mika Oki, Guillaume Pires Parada, Anne Seidel, Charles Washington, v4w.enko a. o. o. / See the exhibition! Place your things you need for the next 24hrs into the wardrobes. JOSEF M. GASSNER / WHAT HAS THE UNIVERSE TO DO WITH ME? How do I listen to lecture information without loosing contact to my body? Five brainwave headsets spread out in space. Place them on your head while you talk, listen, relax, kiss, dance, rest and allow the void. A conversation between human beings about the universe. EAT. DANCE. SLEEP. DO. BE.